Some time ago we reviewed a game called Heads Or Tails; it’s quite a dated Playtech creation in which you are betting on the toss of a coin and we described it as the most basic game we’d reviewed. We now have a rival for that title and it’s a much newer release from Play N Go called Beat Me. Like Heads Or Tails, Beat me is the type of game that can occupy a quick coffee break or a longer session. It’s also the type of game which might benefit from a strategy or two. Essentially all you have to do is draw a higher card than the dealer. When you load up the game you’ll be faced with something akin to a Blackjack table but with fewer options. There’s a single ‘Bet’ area with a smaller ‘Tie’ area to the left. Your first task is to choose a bet by selecting a chip size from the choice in the bottom left hand corner. Click in the ‘Bet’ area to place your bet and then press the ‘Deal’ button underneath. You will be dealt a card and then the dealer will get one; the player with the highest card wins at odds of 1/1. Go To War – another bet is placed with the same value as the first and more cards are dealt to each player. Surrender – Give up your bet and start over. 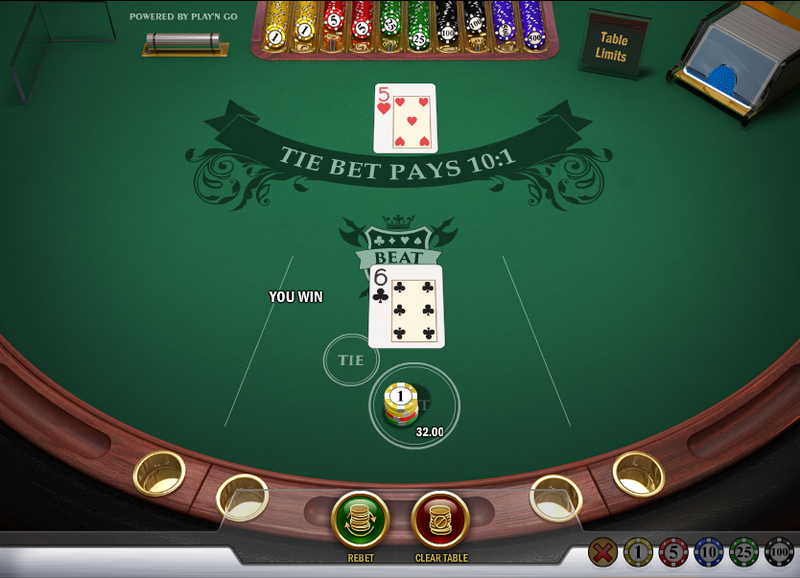 You can also place a bet on drawing the same cards by placing your chip in the ‘Tie’ area before the deal. It pays at 10/1 but beware the Tie bet because it has an RTP of just 81.30% compared to 97.67%. Interestingly that’s a higher RTP than casino roulette (97.30%) which suggests that you have a slightly better chance of making a strategy such as the Martingale pay off. This strategy involves doubling up your stake with every subsequent loss; when you win, start with the minimum bet again. We like this game particularly because it offers better odds than casino roulette and that Martingale strategy is quite tempting. Worth checking out.